Israel has admitted to using white phosphorus during its war on the Gaza Strip earlier this year, but says it did so in accordance with international law. The admission came in a 163-page document published by the Israeli foreign ministry on Thursday ahead of a UN report next week. The Israeli army "used munitions containing white phosphorus" in Gaza, the document said, but it denied violating international law, saying it had not fired such weapons inside populated areas. Al Jazeera's Sherine Tadros, reporting from Jerusalem, said the Israeli army had initially denied using white phosphorus, a chemical agent that causes severe burns. 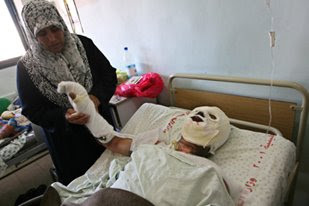 "During the war, when we first started seeing the white phosphorous, the Israeli army said that everything it was using was in compliance with international law; it would not tell us whether or not it was using it," she said. "As the campaign went on, it became very obvious [on television] that it was being used and the Israeli army, as well as government spokesmen, told us that it was being used," our correspondent said. "The caveat that the Israeli army pressed on was that it was being used within the rules of war; that meant it was not being used amid a civilian population and that it was being used to provide a smokescreen legitimately, as opposed to illegitimately." International law permits the use of white phosphorus as an "obscurant" to cover troop movements and prevent enemies from using certain guided weapons. The Israeli government report follows charges from the UN and human rights groups that Israeli forces committed war crimes and violated international law during the operation. UN officials have also said that they have evidence that white phosphorus was used in an attack on the UN relief agency's main building in Gaza that left three people injured. But the government defended its military campaign as a "necessary and proportionate" response to Hamas rocket fire at Israel. "Israel had both a right and an obligation to take military action against Hamas in Gaza to stop Hamas' almost incessant rocket and mortar attacks," it said. The Israeli government also said it is investigating 100 complaints of misconduct by its forces during the three week war that began on December 27. Our correspondent said the report follows several testimonies from witnesses and human rights organisations about the Israeli military's conduct. "What we've seen in the past few months since the end of the war are various human rights reports from Amnesty International, the United Nations, Human Rights Watch, as well as testimonies coming out from army soldiers themselves," she said. John Ging, the head of the United Nations Relief and Works Agency (UNRWA) in Gaza, welcomed the report as an "acknowledgment that an investigation has to be done into what happened" during the conflict. But he told Al Jazeera that the process has taken "far too long". "What we actually need is an independent investigation that is credible for both sides," he said. Israel has consistently said its troops respected international law during the war which ended in January. Palestinian officials say 1,417 Palestinians were killed, including 926 civilians.